Graphic designers visually represent concepts in several of their daily tasks, such as in icon design. Computational systems can be of help in such tasks by stimulating creativity. However, current computational approaches to concept visual representation lack in effectiveness in promoting the exploration of the space of possible solutions. 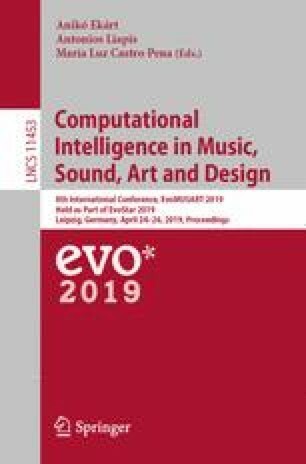 In this paper, we present an evolutionary approach that combines a standard Evolutionary Algorithm with a method inspired by Estimation of Distribution Algorithms to evolve emoji blends to represent user-introduced concepts. The quality of the developed approach is assessed using two separate user-studies. In comparison to previous approaches, our evolutionary system is able to better explore the search space, obtaining solutions of higher quality in terms of concept representativeness. João M. Cunha is partially funded by Fundação para a Ciência e Tecnologia (FCT), Portugal, under the grant SFRH/BD/120905/2016; and is based upon work from COST Action CA15140: ImAppNIO, supported by COST (European Cooperation in Science and Technology): www.cost.eu. This work includes data from ConceptNet 5, which was compiled by the Commonsense Computing Initiative and is freely available under the Creative Commons Attribution-ShareAlike license (CC BY SA 4.0) from conceptnet.io.